6 The Sine Rule 5.02 10 9.10 ! 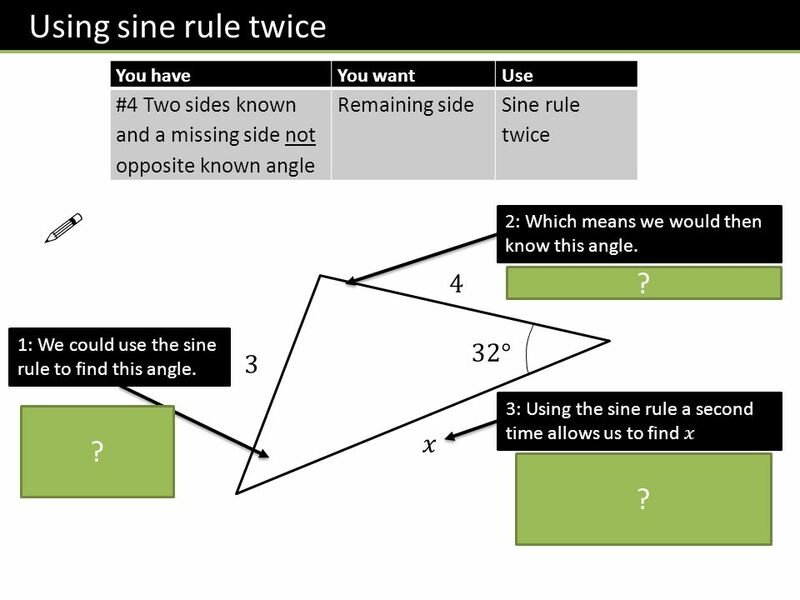 Sine Rule: 𝑎 sin 𝐴 = 𝑏 sin 𝐵 = 𝑐 sin 𝐶 ? 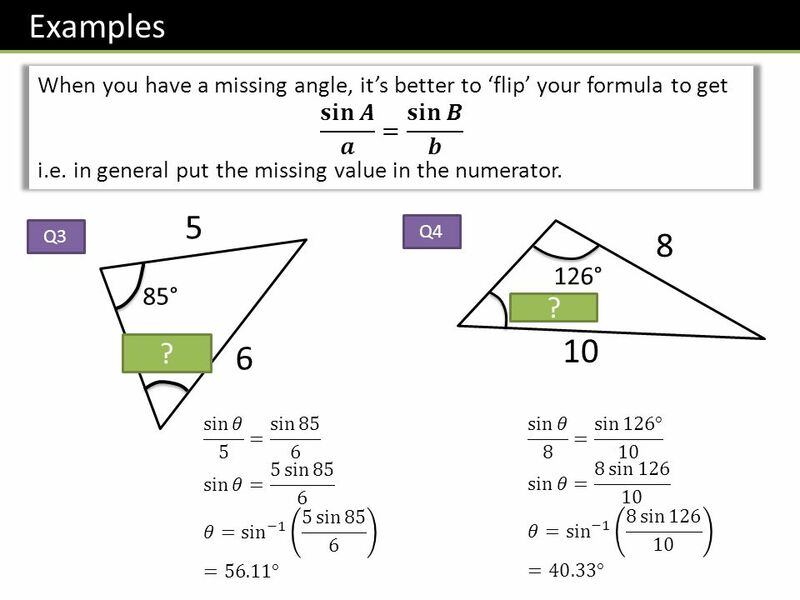 𝑄 82° 𝑃 20° 10𝑚 𝜃 85° 5𝑐𝑚 12𝑚 𝑅 Determine the angle 𝜃. sin 𝜽 𝟏𝟎 = sin 𝟖𝟐 𝟏𝟐 𝜽=𝒔𝒊 𝒏 −𝟏 𝟏𝟎 sin 𝟖𝟐 𝟏𝟐 =𝟓𝟓.𝟔° Determine the length 𝑃𝑅. 𝑷𝑹 𝐬𝐢𝐧 𝟐𝟎 = 𝟓 𝐬𝐢𝐧 𝟖𝟓 𝑷𝑹= 𝟓 𝐬𝐢𝐧 𝟐𝟎 𝐬𝐢𝐧 𝟖𝟓 =𝟏.𝟕𝟐𝒄𝒎 ? ? 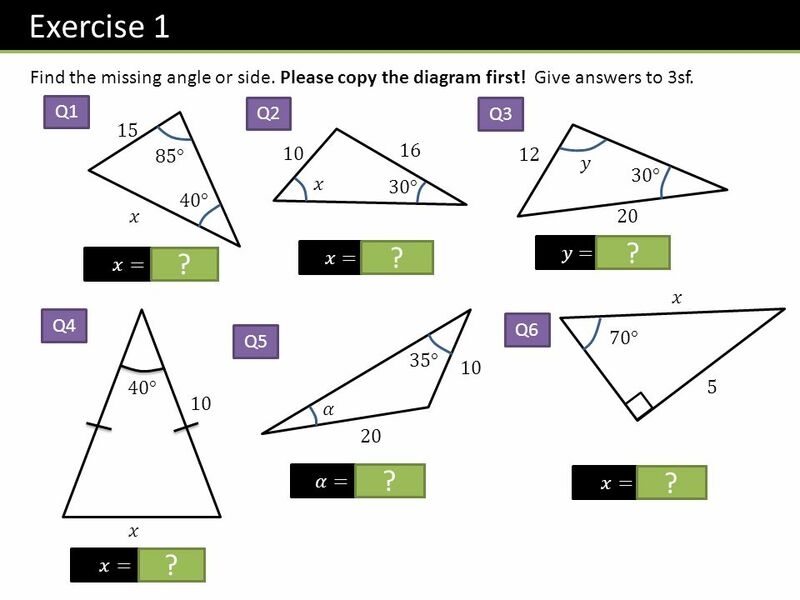 10 Exercise 1 Find the missing angle or side. Please copy the diagram first! 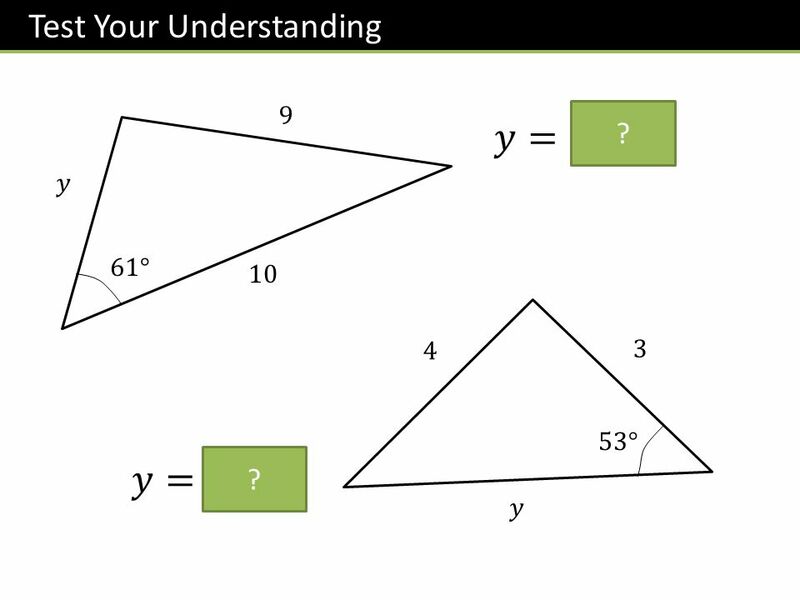 Give answers to 3sf. Q1 Q2 Q3 15 10 16 85° 12 𝑦 30° 𝑥 30° 40° 𝑥 20 𝑥=53.1° ? 𝑦=56.4° ? 𝑥=23.2 ? 𝑥 Q4 Q6 Q5 70° 35° 10 40° 5 10 𝛼 20 𝛼=16.7° ? 𝑥=5.32 ? 𝑥 𝑥=6.84 ? 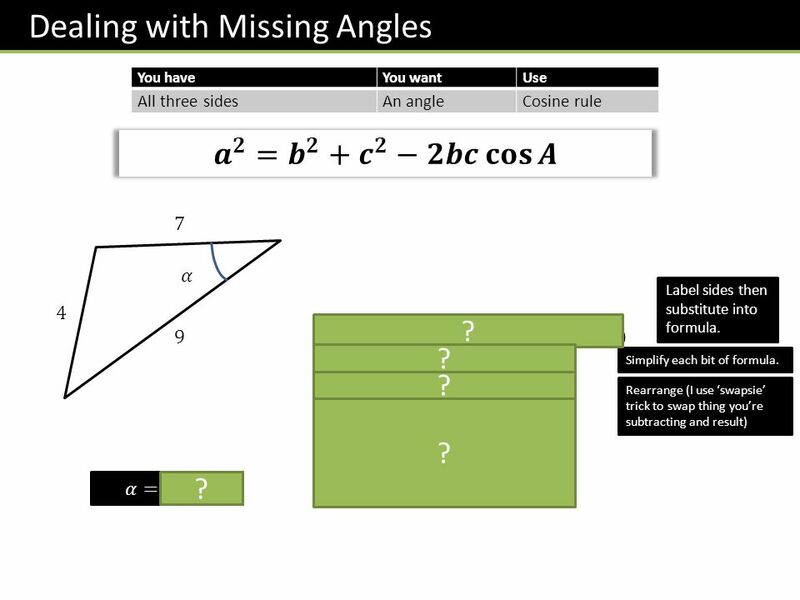 14 Exercise 2 Use the cosine rule to determine the missing angle/side. Quickly copy out the diagram first. Q1 Q2 Q3 135° 58 5 5 8 𝑥 100° 60° 70 𝑥 7 𝑦 𝑥=6.24 ? 𝑦=10.14 ? 𝑥=50.22 ? Q6 Q5 𝑥 Q4 6 4 5 75° 𝑥 10 43° 65° 8 6 3 𝑥=4.398 ? 𝑥 3 𝑥=9.513 ? 𝑥=6.2966 ? 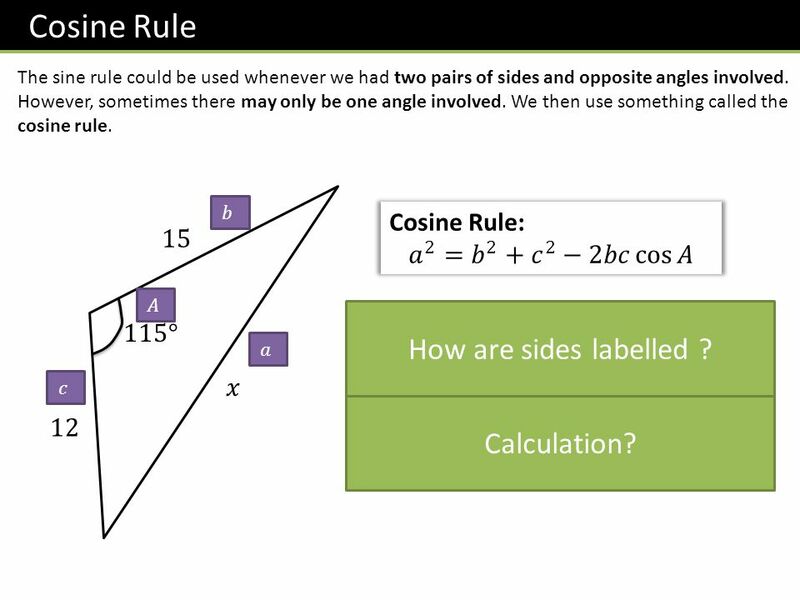 You have You want Use All three sides An angle Cosine rule 𝒂 𝟐 = 𝒃 𝟐 + 𝒄 𝟐 −𝟐𝒃𝒄 𝐜𝐨𝐬 𝑨 7 𝛼 Label sides then substitute into formula. 4 𝟒 𝟐 = 𝟕 𝟐 + 𝟗 𝟐 − 𝟐×𝟕×𝟗× 𝐜𝐨𝐬 𝜶 𝟏𝟔=𝟏𝟑𝟎−𝟏𝟐𝟔 𝐜𝐨𝐬 𝜶 𝟏𝟐𝟔 𝐜𝐨𝐬 𝜶 =𝟏𝟑𝟎−𝟏𝟔 𝐜𝐨𝐬 𝜶 = 𝟏𝟏𝟒 𝟏𝟐𝟔 𝜶= 𝐜𝐨𝐬 −𝟏 𝟏𝟏𝟒 𝟏𝟐𝟔 =𝟐𝟓.𝟐° ? 9 ? Simplify each bit of formula. ? Rearrange (I use ‘swapsie’ trick to swap thing you’re subtracting and result) ? 𝛼=25.2° ? 17 Exercise 3 1 2 3 12 5.2 7 6 𝛽 𝜃 11 5 𝜃 13.2 6 8 𝛽=92.5° ? 𝜃=71.4° ? 𝜃=111.1° ? 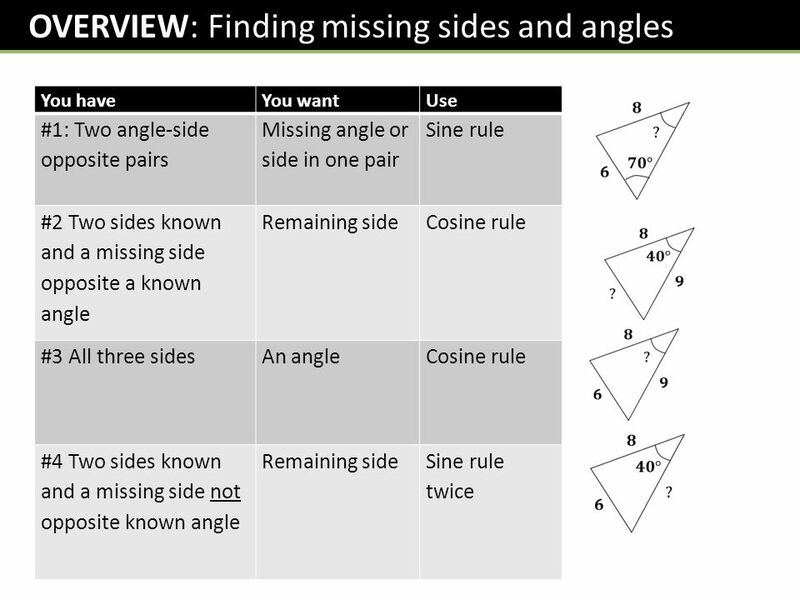 You have You want Use #4 Two sides known and a missing side not opposite known angle Remaining side Sine rule twice ! 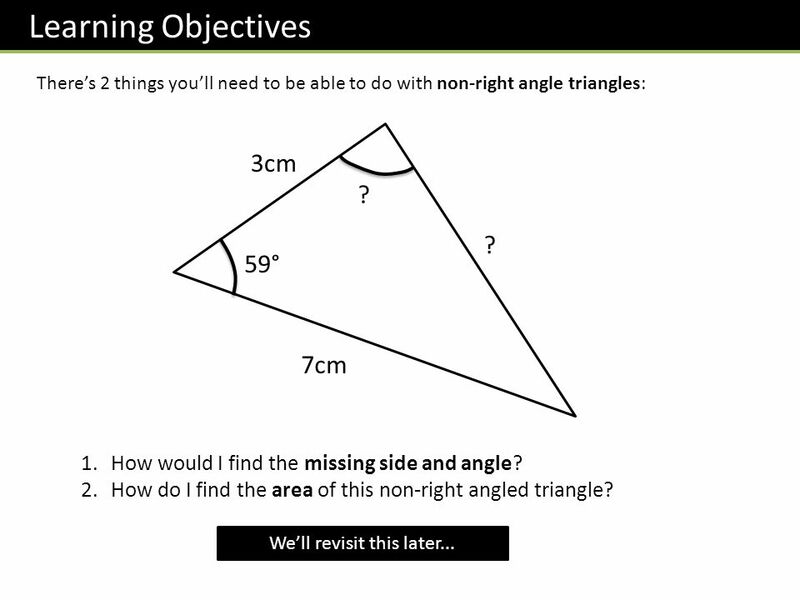 2: Which means we would then know this angle. 4 𝟏𝟖𝟎−𝟑𝟐−𝟒𝟒.𝟗𝟓𝟓𝟔=𝟏𝟎𝟑.𝟎𝟒𝟒𝟒 ? 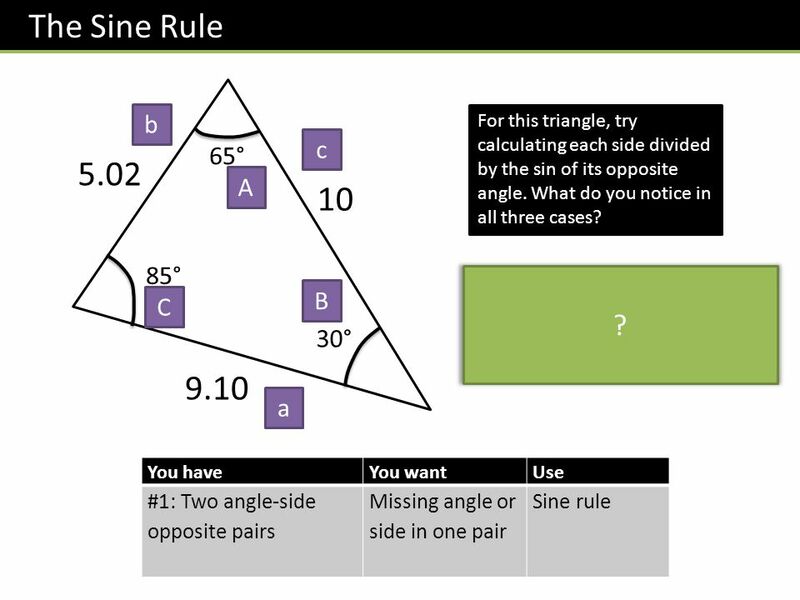 1: We could use the sine rule to find this angle. 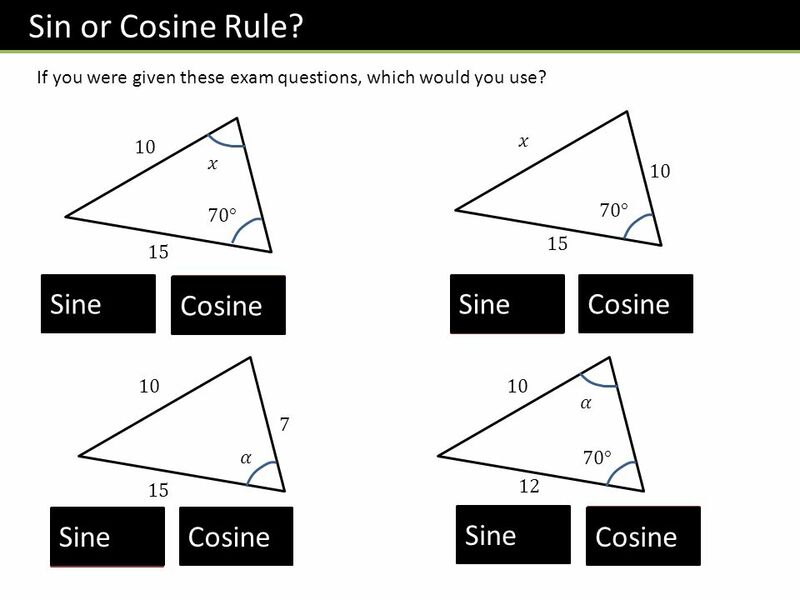 32° 3 3: Using the sine rule a second time allows us to find 𝑥 ? sin 𝐴 4 = sin 32 3 𝐴= ° 𝑥 𝑥 sin = 3 sin 32 𝑥=5.52 𝑡𝑜 3𝑠𝑓 ? 21 Where C is the angle wedged between two sides a and b. 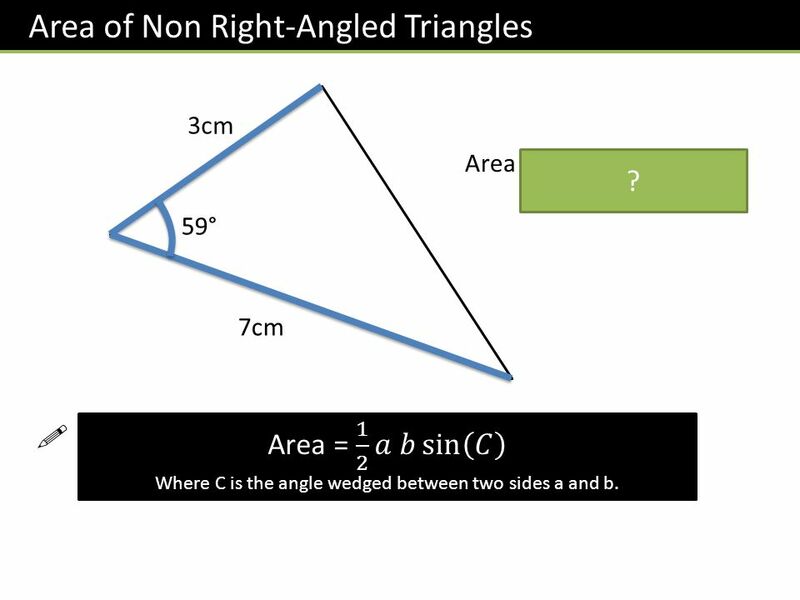 Area of Non Right-Angled Triangles 3cm Area = 0.5 x 3 x 7 x sin(59) = 9.00cm2 ? 59° 7cm ! Area = 1 2 𝑎 𝑏 sin 𝐶 Where C is the angle wedged between two sides a and b. 24 Exercise 4 Q3 Q1 Q2 Q4 5 3.6 3 1 1 5 100° 3.8 75° 8 1 5.2 Area = 7.39 ? 70° 𝐴𝑟𝑒𝑎= =0.433 ? Area = 9.04 ? Area = 8.03 ? 2cm Q5 Q7 Q6 110° 8.7𝑐𝑚 3cm Area = 3.11𝑐 𝑚 2 ? 49° 64° Q8 4.2m 3m 𝐴𝑟𝑒𝑎=29.25𝑐 𝑚 2 ? 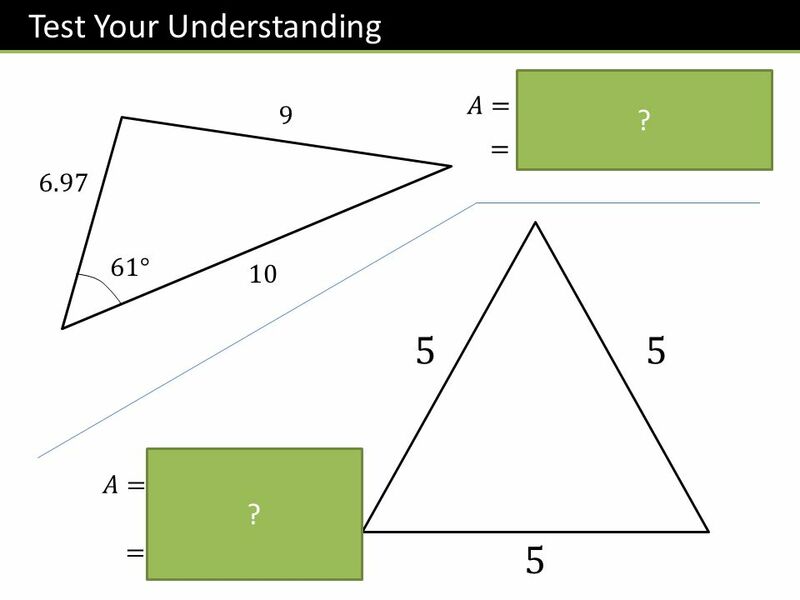 𝑃 is the midpoint of 𝐴𝐵 and 𝑄 the midpoint of 𝐴𝐶. 𝐴𝑃𝑄 is a sector of a circle. 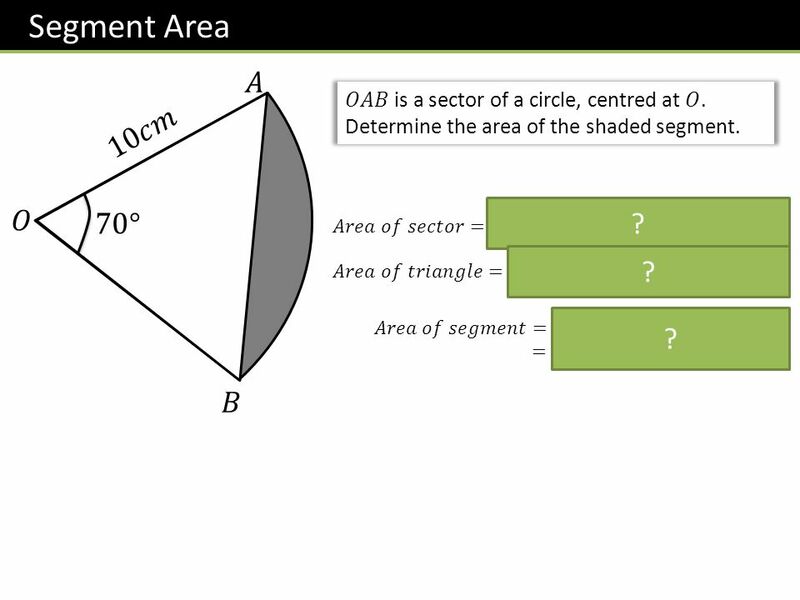 Find the shaded area. 5.3m ? 1 2 × 6 2 × sin 60 − 1 6 𝜋 =10.9𝑐 𝑚 2 Area = 6.29 𝑚 2 ? 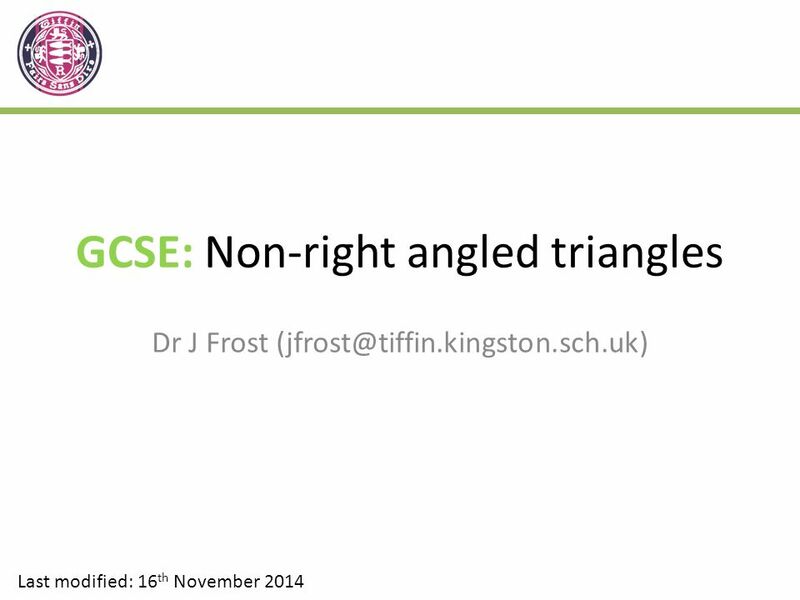 Download ppt "GCSE: Non-right angled triangles"
Year 9: Quadratic Equations Dr J Frost Last modified: 31 st December 2013. 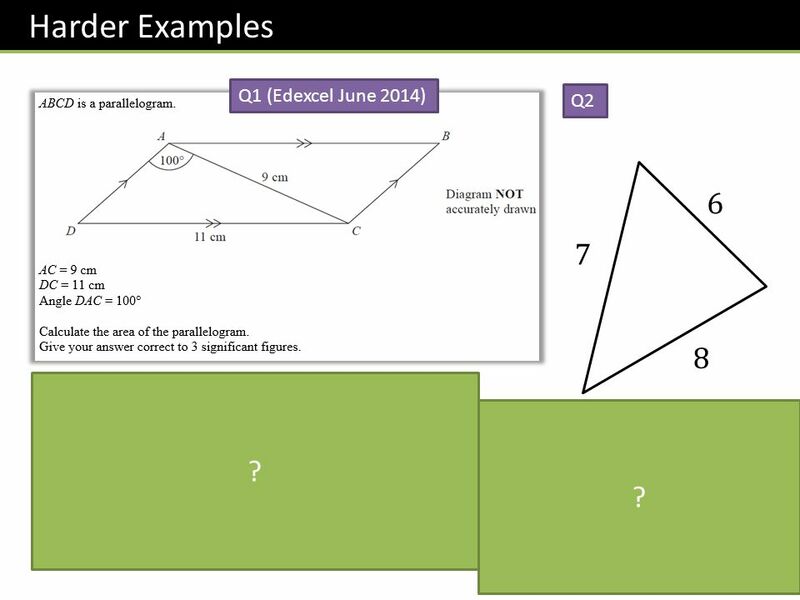 C3 Chapter 1 Algebraic Fractions Dr J Frost Last modified: 13 th May 2014. C1 Chapter 6 Arithmetic Series Dr J Frost Last modified: 7 th October 2013. 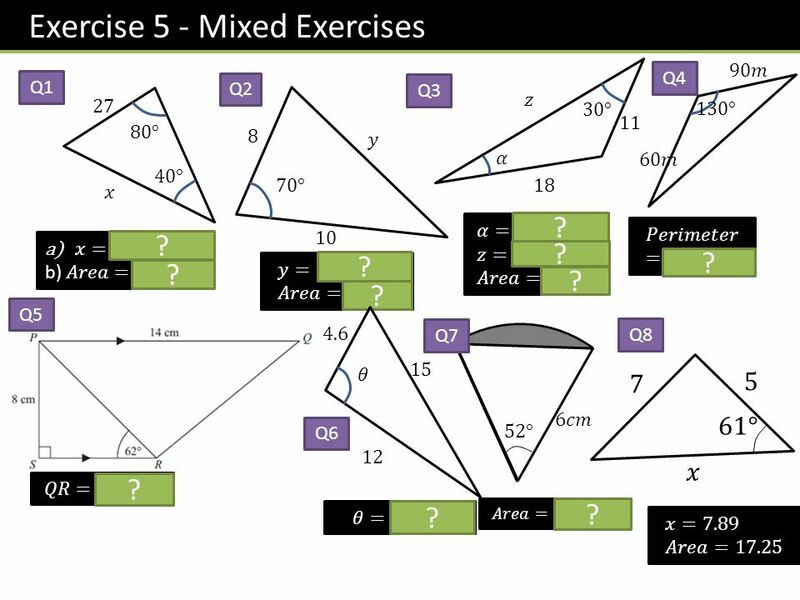 S3: Chapter 1 – Combining Variables Dr J Frost Last modified: 28 th November 2014. S2 Chapter 5: Normal Approximations Dr J Frost Last modified: 29 th September 2014. C4 Chapter 2: Parametric Equations Dr J Frost Last modified: 19 th November 2014. 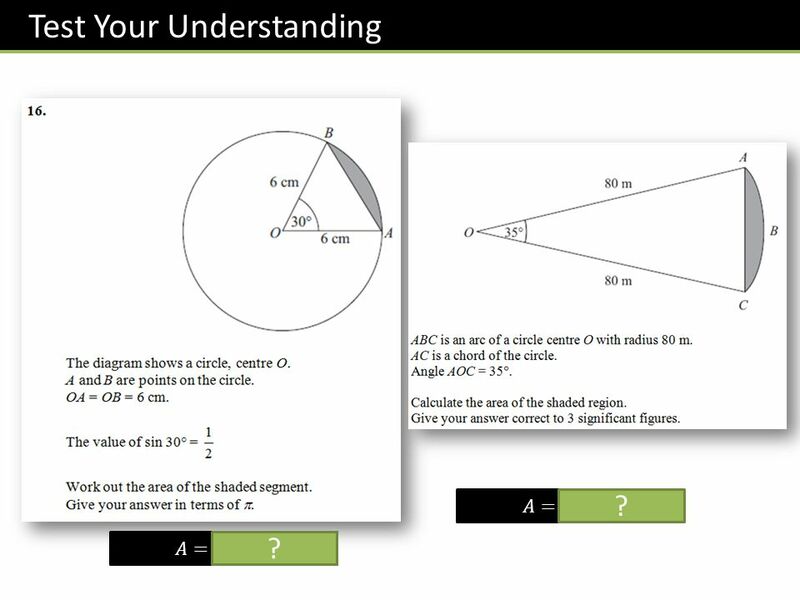 Dr J Frost GCSE Circle Theorems Dr J Frost Last modified: 19th February 2014. 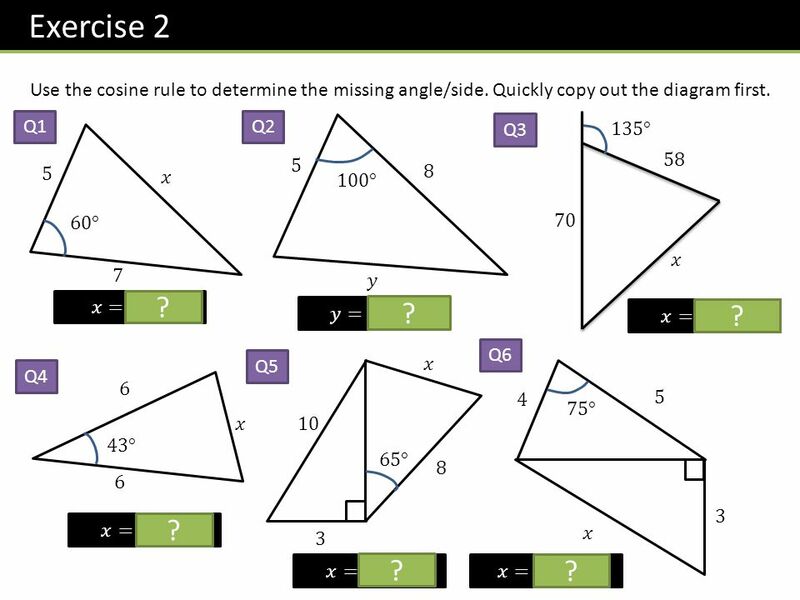 9.6 Apply the Law of Cosines In which cases can the law of cosines be used to solve a triangle? What is Heron’s Area Formula? 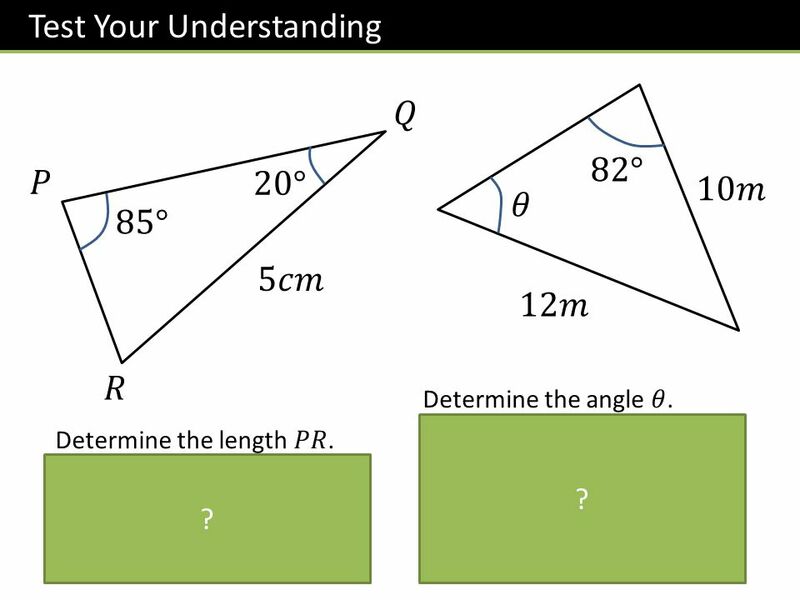 What is the semiperimeter? Powerpoint hosted on Please visit for 100’s more free powerpoints. 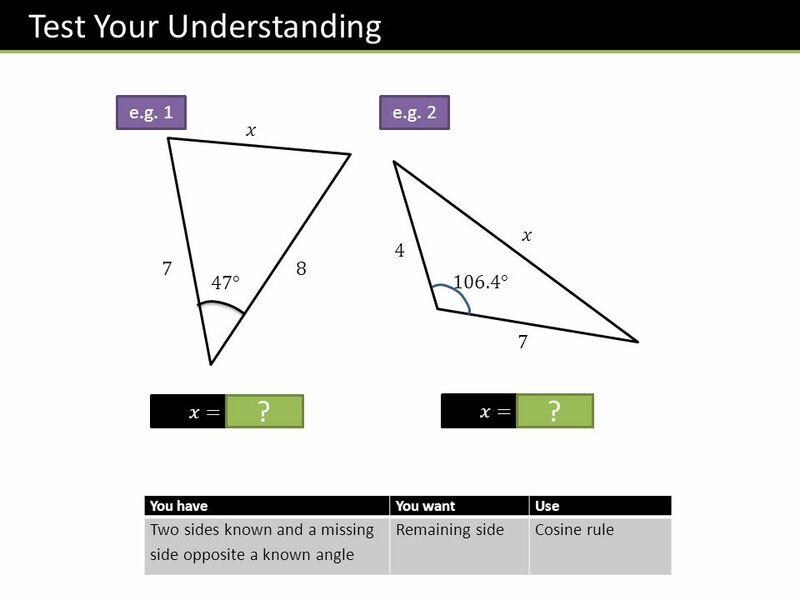 Introduction In the previous lesson, we applied the properties of similar triangles to find unknown side lengths. We discovered that the side ratios of. Engineering math Review Trigonometry Trigonometry Systems of Equations Systems of Equations Vectors Vectors Vector Addition and Subtraction Vector Addition. EXAMPLE 1 Solve a triangle for the SAS case Solve ABC with a = 11, c = 14, and B = 34°. 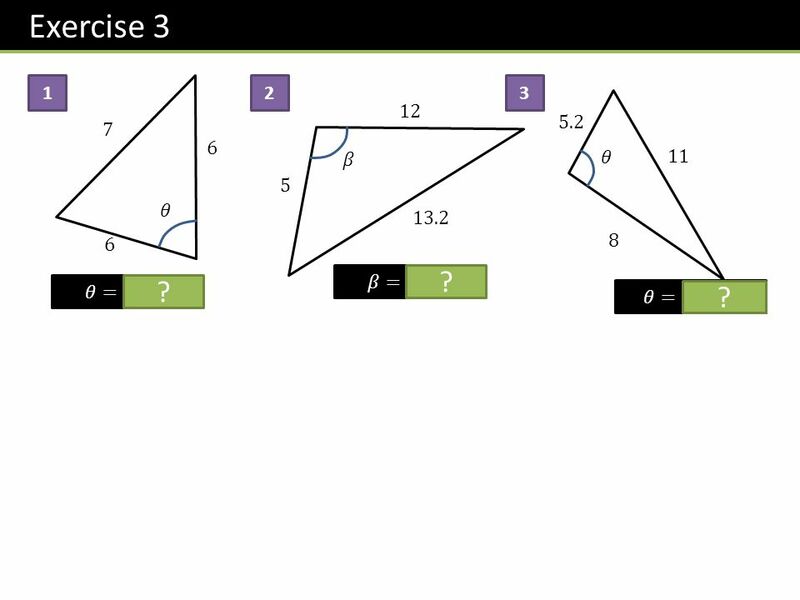 SOLUTION Use the law of cosines to find side length b. b 2 = a. 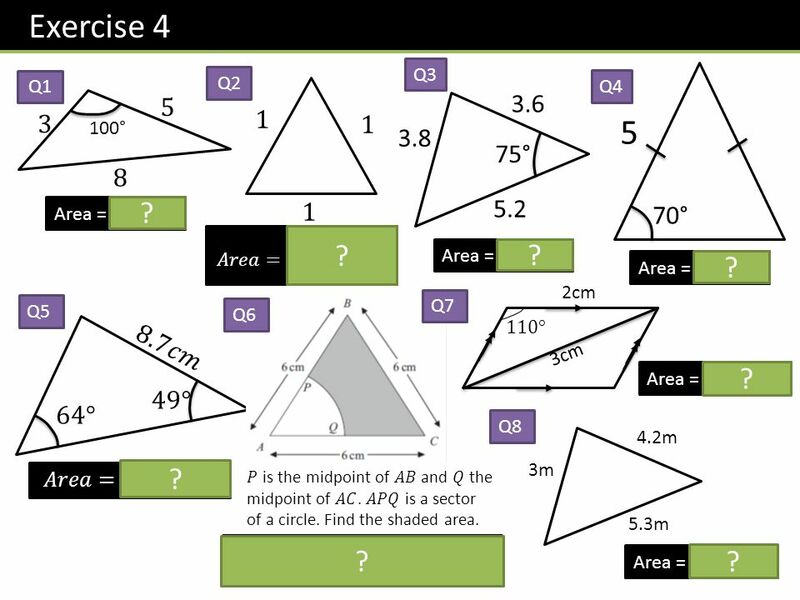 Starter a 6 c A 49° 96° 1.Use the Law of Sines to calculate side c of the triangle. 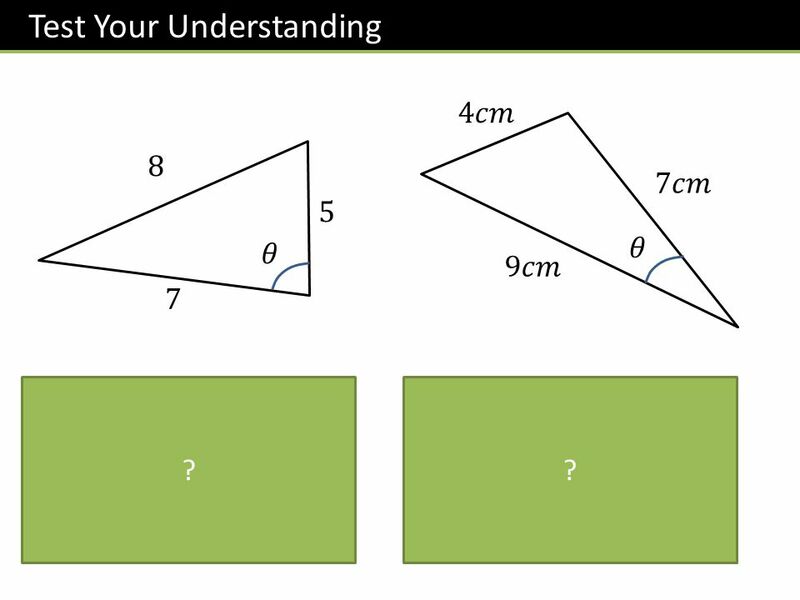 2.Now find the Area of a Triangle. 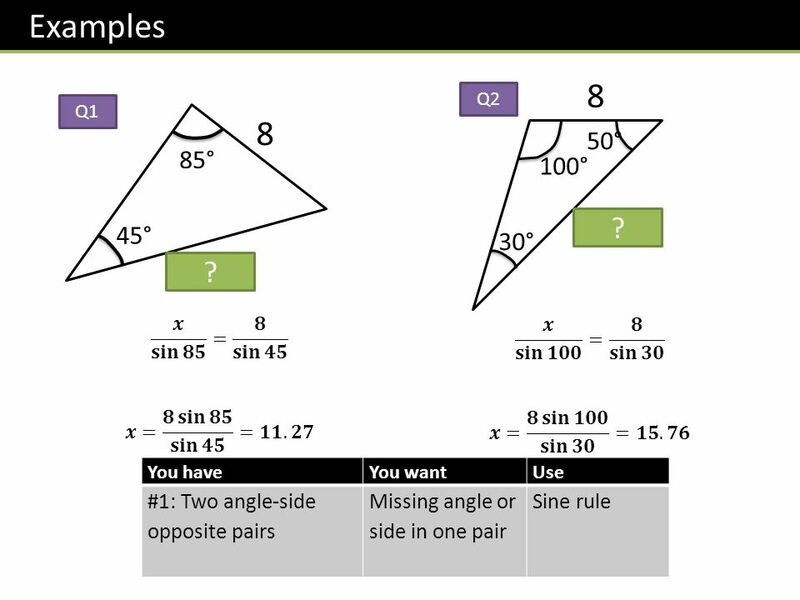 Trigonometry 2 Aims Solve oblique triangles using sin & cos laws Objectives Calculate angles and lengths of oblique triangles. 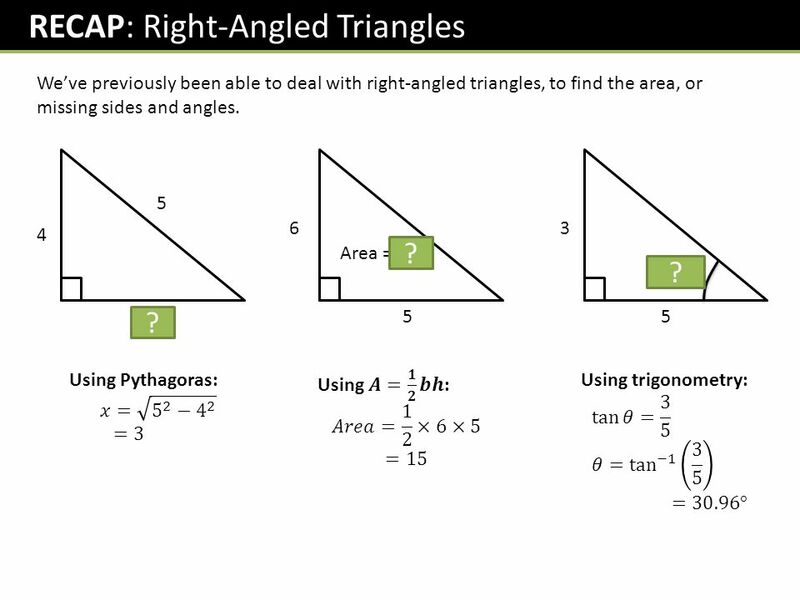 Calculate angles and lengths. 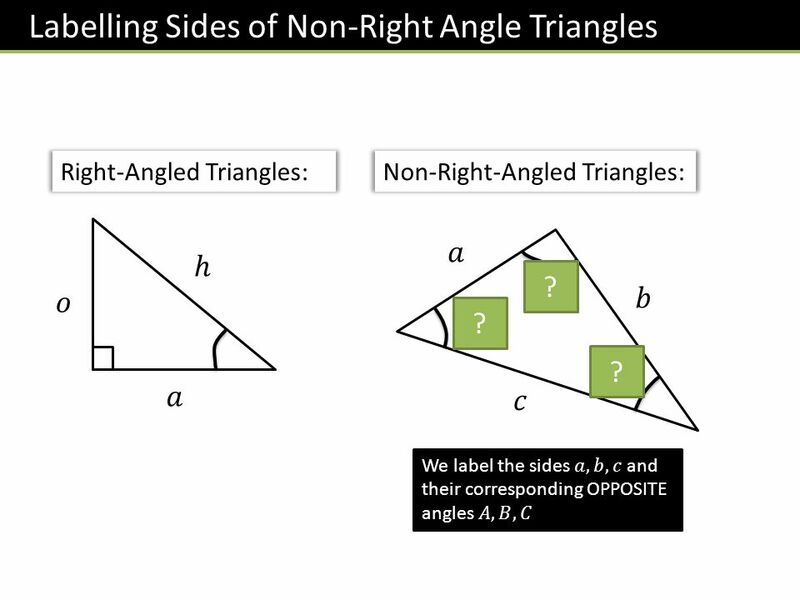 Trigonometrical rules for finding sides and angles in triangles which are not right angled. 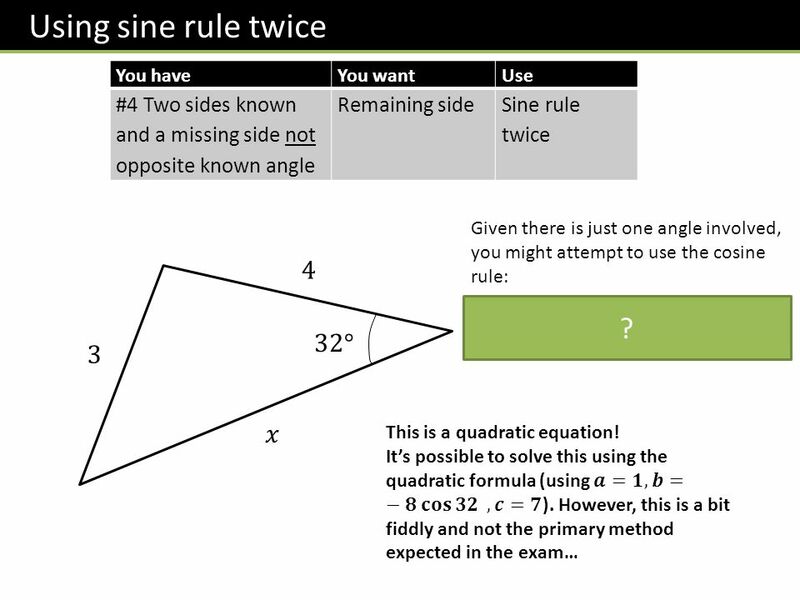 The Law of SINES. When Do I use Law of Sines vs. Law of Cosine ? Two sides One opposite angle given Angle opposite side Two angles One opposite side given.